Sometime accidentally most of the Facebook users have to lost his photos, videos, messages, contact list and other important information from his account. In this guide we have to discuss a trick how to retrieve deleted Facebook photos, videos and messages without any extra effort. All we know that Facebook is very popular free to use social networking website. Facebook allows his registered users to create profiles, upload photos and video, send messages and many more. But sometime when you delete your Facebook account or accidentally delete complete videos, photos and other important things from your Facebook account. In that situation you have to lost all the photos, videos, messages and other things from your Facebook account. Sometime you may be accidentally delete your favourite videos, photos and other things from your registered Facebook account. At that time there is no way to use undo command to get back all delete things. But there is no need to worry you can easily retrieve delete Facebook photos, videos and messages on your system. Step 1: First you have to open the General Account Settings of your Facebook account. Step 2: Click on the “Download a copy of your Facebook data” option. In Download your information box click on the “Download Archive” button. Note: If you are doing this process first time then you will get additional dialog box. First you will get “Request My Download” box in which you have to click on the “Start My Archive” button. Second you will get “Download Requested” box, click on the “Okay” button. Next time again you have to open the General Account Settings of your Facebook account. 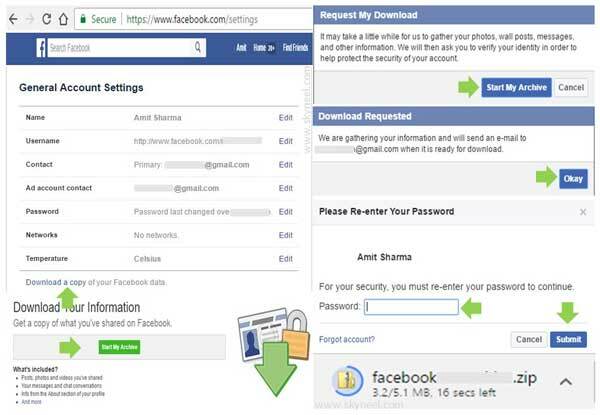 Now, choose Download a copy of your Facebook data button. Step 4: Now you have to fill password of your registered Facebook account and finally click on the Submit button. A zip file downloaded on your PC or Laptop. After finish the downloading process, you have to extract the zip file from your download folder. I hope after reading given latest trick you can easily retrieve deleted Facebook photos, videos and messages. If you have any suggestion regarding this guide then please write us in the comment box. Thanks to all.